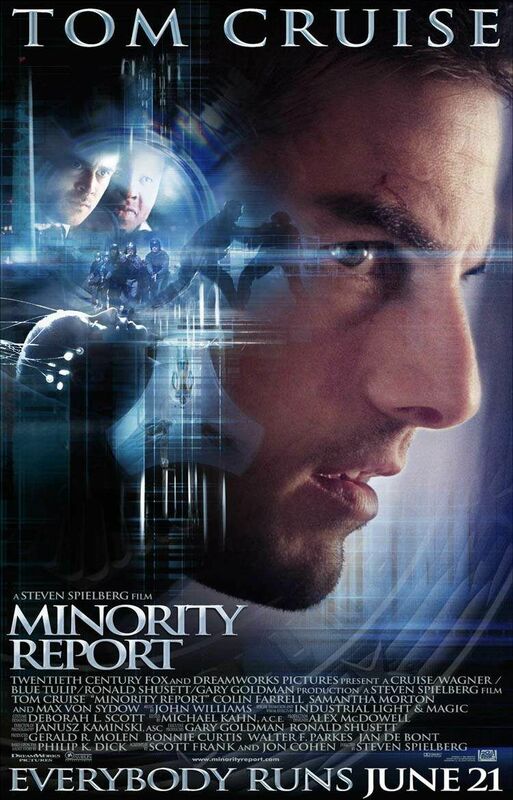 My expectations for Minority Report were a little higher than they were for the average film. After all, the video game was excellent with the story (almost) holding its own against the gameplay. The fact that Tom Cruise is the lead is also intriguing since he was so popular back in the day and the concept was great. I also saw a clip of it a while back and it was pretty cool how stores could find out what you wanted through an eye scan as you walked in the store. This was a film with a lot of potential, but my hopes crashed into the ground once the film actually started. This is definitely not a title that I would recommend! The film starts out by introducing us to this new world. Pre Crime has officers who are able to go travel around and stop crimes before they actually occur. At first, I thought that they were time travelling, which would have created a lot of plot questions, but they just go to the location of the crime and stop it from being committed. This is possible through the three pre cogs that exist at their main headquarters. They can predict a murder a day before it happens or sometimes only a few hours in advance. John Anderton is the main person in charge of finding out where the murder is taking place by analyzing the visions that the pre cogs have. It’s a tough job, but someone’s got to do it! One day, the pre cogs announce that John will murder someone so now he must run for his life and prove that he is innocent! Of course, we have to wonder…is he innocent? I guess I should start out with the beginning. We get a random bunch of scenes with people being murdered and everything is gritty and chaotic. We eventually see that this is to show how gruesome murder is and how John is around to prevent it. Then we see the scene like 5-8 more times as John tries to figure out where the murder is. Let’s not forget that we see a lady drowning about a dozen or so times as well. Murder is a main theme of the film so it’s to be expected that we’ll see a lot of it, but we don’t need to keep seeing it over and over again. Telling us what John is about to do would have a similar effect. It’s also just not a very good way to start a film. You need a beginning that makes you want to watch the film, not one that chases you away! Also, this film takes place in the future and there’s a lot that they can do with that. Unfortunately, they never delve into any of the interesting parts. I like to see how films imagine the future to be because they can be close to the truth in some instances and far removed in others. I can see eye scans delivering personal advertisements in the far future and likewise with hover cars. (Although I doubt they’ll be building any vertical roads in the near or far future) We only get glimpses of these things and they were all more interesting than the main plot. Why? The actual plot is a pretty sound one and it’s like a thriller with a bit of mystery in it. What stops the film from being enjoyable is the unnecessary grotesqueness in several scenes. We have a guy who’s eyeball is missing and it’s really hard to look at him. Now, in real life it’s just sad to see that happen to someone, but in a film…do we need to see this? I don’t think so since it’s just there for shock value. Another set of scenes would be the eyeball transaction. Ugh.. This was easily one of the worst collection of scenes in the film. John decides that he needs new eye balls so he goes to an illegal surgeon. This surgeon isn’t very hygenienic by the way and he used to be a bigger criminal. He’s still illegal, but this is a more subtle practice. He reminds John of this once John is paralyzed and it’s easy to expect the worst. Even without the worst happening, the whole scene is very gross and we even see John’s old eyes in a plastic bag. Just thinking about it makes me wince. No, it doesn’t stop there! After the long transfer, John goes to the kitchen to make himself a sandwich. He ends up biting a chunk out of a mold sandwich and then he downs it with a green colored milk. Now they’re just adding insult to injury aren’t they? That was pretty gross and it certainly didn’t help the film. The Doctor’s assistant is also pretty bad and she adds nothing to the story except to make you feel bad for John. Your suspense for disbelief will also need to be decently high to accept the fact that the Government allows Pre Crime to have so much power. Their spider bots can go into your house without a warrant to scan your eyes. I really don’t think that will be happening anytime soon. These spider bots are also not as advanced as they should be since jumping into a pool is enough to fool their heat sensors. Is that really all it takes to evade these guys? My dog Sonic would be able to sniff out the villains faster than the bots! All right, I’ve covered most of the bases for the film. Now, let’s talk about the characters. John Anderton is the main character of the story and he certainly has a lot more drama than the average lead. After a traumatic event caused him to lose his son, John split up with his wife and became addicted to the “clear” whistle. It’s basically a drug and it’s a pretty low time for John. He works at Pre Crime to prevent murder from ever happening again. It’s definitely a move that makes sense in response to this and I don’t mind that he’s still broken up about what happened. It’s been years, but you never forget something like that. Turning to drugs is definitely going too far though since he can vent his frustration through other means. John has his big choice during the climax of the film. Do the legal thing and bring the villain to justice or take out the gun and fire. Ethically, we all know what he should do, but it’s still a hard choice to make in person. I won’t disagree with John’s choice, but I don’t really like how he went about it. Letting the man grab the gun at one point is really not cool and it shows that John should have kept his guard up a little more. John’s a pretty good fighter and he takes on many officers from Pre Crime. The fight scenes were pretty fun even though there weren’t many of them and I would have liked to have seen more of the shockwave gun in action. John is a pretty good character overall. He made some pretty big mistakes, but he’s pretty heroic throughout. I would have liked him more though if he had skipped the drugs and also tried to help the pre cogs sooner. Lamar is an old man who proudly helped to establish Pre Crime. He’s always wanted a chance to end murder once and for all and this was his ticket. Now he is finally preparing to retire and leave the organization to John. Then the big frame up happens and things quickly start to change. Lamar may seem like a nice old man, but I definitely don’t care for him. He doesn’t really possess any of the traits that make a character likable for me, while possessing a few that make it natural for me to dislike him. The character did well inside of his role and it was a necessary one, but I still don’t care for him. Essentially, he was a good addition to the film, but I don’t really sympathize with his plight. Agatha is the main pre cog from the three members and she’s the only one who is shown to be able to talk with the others. (Not that the other two were really in a state to do that) She doesn’t talk all that often, but she definitely helps John out a lot when he is in a pinch. Her fate isn’t very great at the beginning since the Pre Cogs are basically forced to watch the future and alert the people to who will be murdered next. Their minds are always connected to the network so they don’t have much of a choice about anything. It’s a pretty rough way to live and Agatha finally gets her chance for freedom later on. Of course, if the cops catch her and Anderton…it’s all over. She didn’t really have a chance to become a very likable character since she doesn’t really get to adjust to the modern world. She seems like she’s a good person and that’ll have to do. Lara is John’s ex wife and she plays a large role towards the end of the film. I was surprised by it since it appeared like her role would be small at best. She turns out to be pretty good by the end although she certainly made her share of mistakes during the film. Given the circumstances, Lara ends up being one of the better characters in the film. I would have preferred if she could have landed a solid blow on one of the villains at some point, but it wasn’t to be. It’s also disappointing to see the fact that the Pre Cogs are just left in the pool for eternity to help Pre Crime out. Doesn’t anyone see something wrong with this system? It’s obviously not a pleasant experience for the three Pre Cogs and someone should do something about this. It makes you wonder how ethical the world that they live in is. Sure, they’ve effectively gotten rid of murder in that area, but there are still many other crimes out there. Let’s hope the government is prepared for what comes next. Overall, Minority Report definitely couldn’t live up to the video game. The game was awesome on all levels and this one was a pale reflection at best. They both contain many identical scenes, but the game managed to really capture you with the plot without resorting to gross moments or excessive murder displays. The film spent too much time trying to shock the audience instead of just going through the story naturally. The dark element involved in the tragedy for the main character may make him more sympathetic, but it doesn’t help the actual film. Such a move will never help the film since a happier sob story would be better. I don’t recommend this film and if you want a futuristic film that actually shows how the future will probably be in 800 years, I recommend Yugioh 3D Bonds Beyond Time! This entry was posted in Live Action Movie Reviews, Live Action Movies, Reviews and tagged Colin Farrell, Film Review, Minority Report, Review, Samantha Morton, Steven Spielberg, Thriller, Tom Cruise by dreager1. Bookmark the permalink. I didn’t mind this film, I like the concept, and overall is was quite good. I’m not a huge fan of Tom Cruse films, but enjoyed this one. The effects were really good as well.